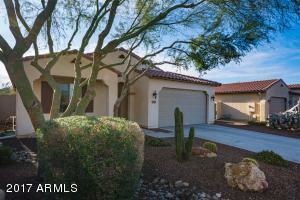 Price reduced on this absolute charmer in sonoran mountain ranch. Tree-lined streets, mountain & desert backdrops - it is hard not to be outside in one of the many parks and walking paths in the community! Home backs to desert wash w/ a view fence - ''trade in'' neighbors looking down on you for privacy, serenity and mountains! Mature fruit bearing citrus in back as well. Inside, this single story, no-stairs home, has the best floor plan in the community. Huge eat-in kitchen with hickory cabs, granite & stainless galore that is open to the family room. Split master is massive with walk-in closet & a view out back. Perfect home office is just around corner. High-end surround sound speakers inset into ceiling convey with home. Pride of ownership is evident the moment you step inside! Directions: Start From 67the ave and happy valley road. From there, go Head north on 67th ave (pyramid peak parkway), turn left on sonoran mountain ranch road, turn right on nadine way, turn right on 70th lane and left on mayberry. House is on right at 6931.